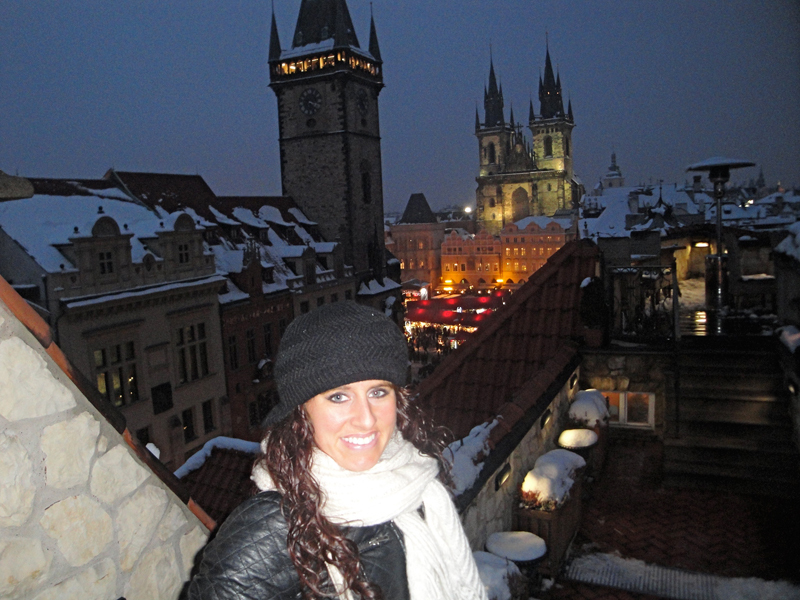 A weary traveler cannot find a more perfect perch than atop the Hotel U Prince in Old Town Square in Prague. 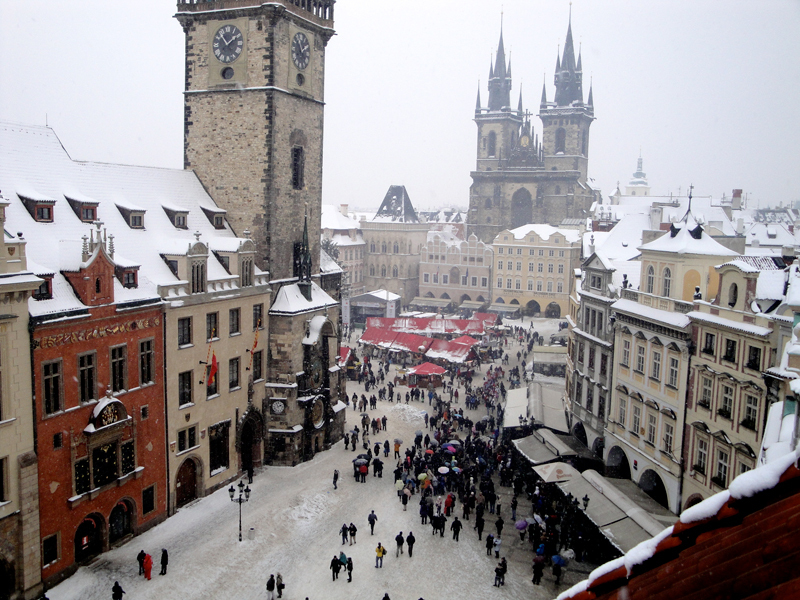 The building procures a spectacular bird's-eye view of the gorgeous "City of a Hundred Spires". What could be even better than a breathtaking view? The answer is simple. 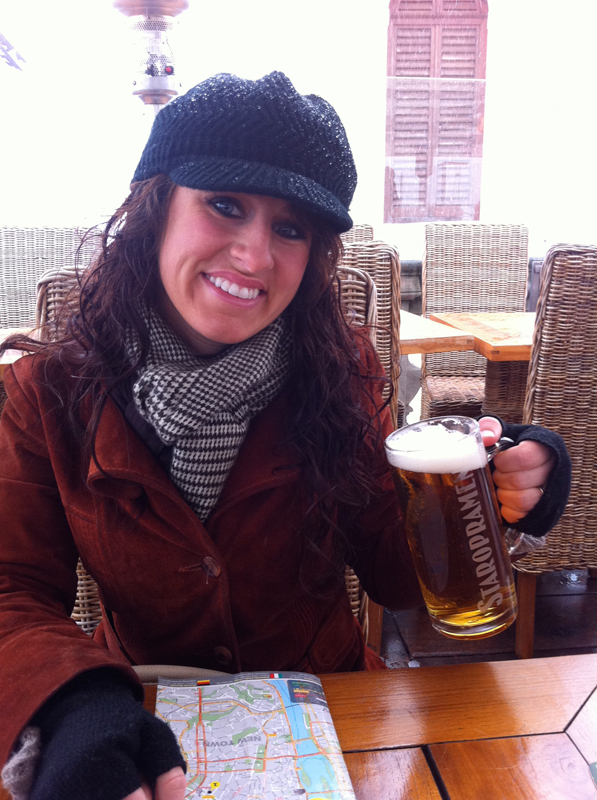 Add a delectable restaurant with a varied and delicious menu, complete with friendly servers (friendliness can be a rarity in Prague, I fear). 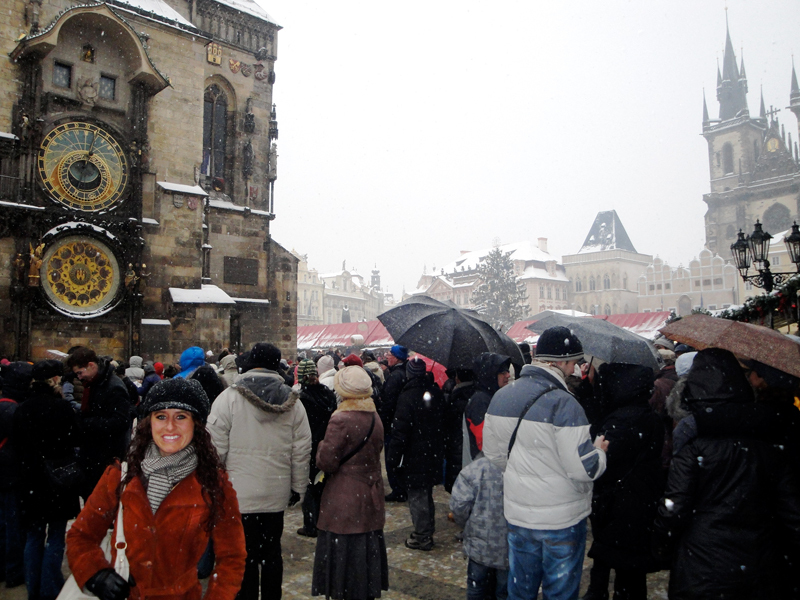 On our trip to Prague last December 2010, we encountered a meteorological phenomenon: a blustery snowstorm. 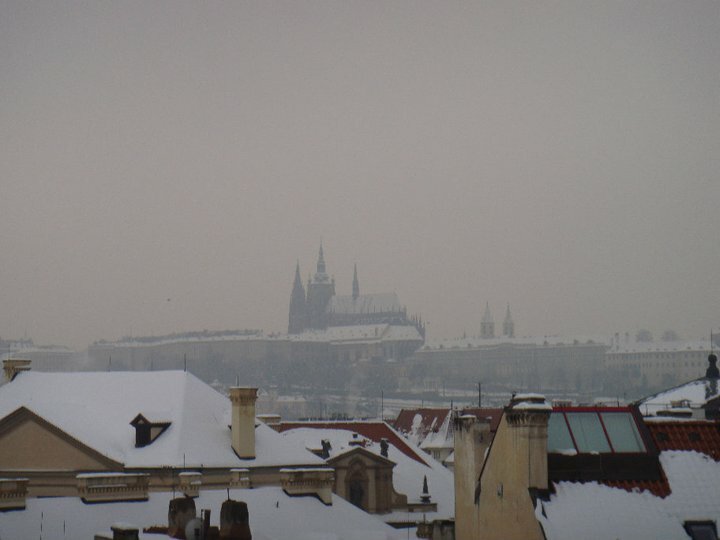 Strange as it may seem, Prague is not accustomed to such bountiful snowfalls and rarely tolerates a mediocre dusting. Consequently, this quaint town struggled to clean its streets and accommodate its guests in such conditions. As our European tour so far had been one giant snow day, the powdery conditions were no stranger to us. We relished viewing the Christmas decorations in their blanket of fluff. 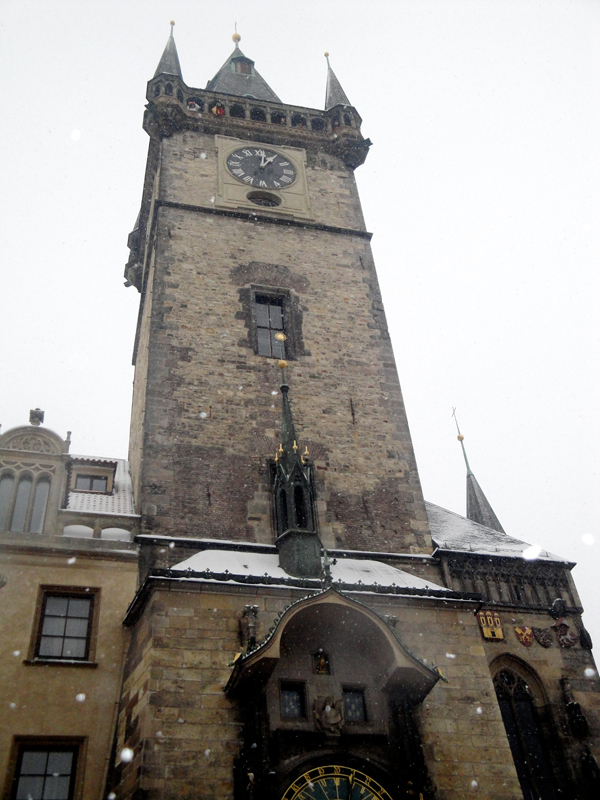 Nick and I were staying at the Design Metropol on Národní Street, and decided to venture north towards Old Town Square to view the typical tourist item: the Astronomical Clock. 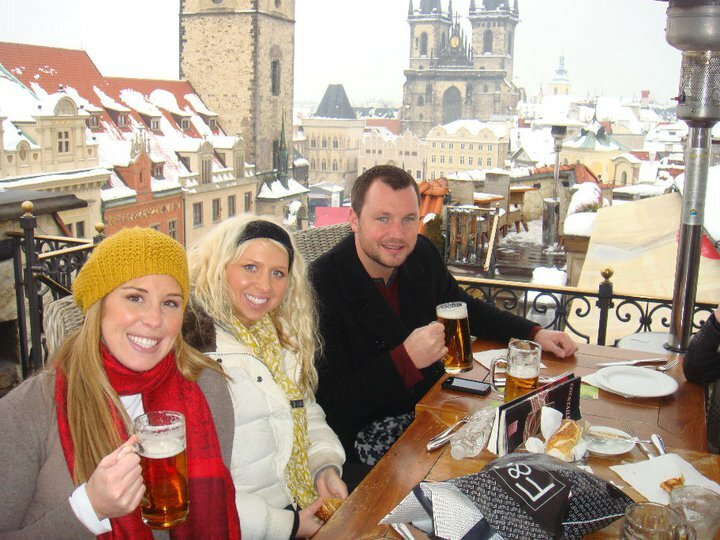 We lazily strolled through the ambling streets of Old Town, casually stopping in the copious Bohemian crystal stores and hat shops, and eventually found ourselves in the middle of majestic Old Town Square. We conveniently arrived just in time for the show, which is every hour on the hour, and consists of the twelve apostles making their way across the front of the clock, as well as an imposing figure of Death shaking its hourglass. The little show ends with the clock chiming the hour and a herald blows his trumpet off the four corners of the tower. 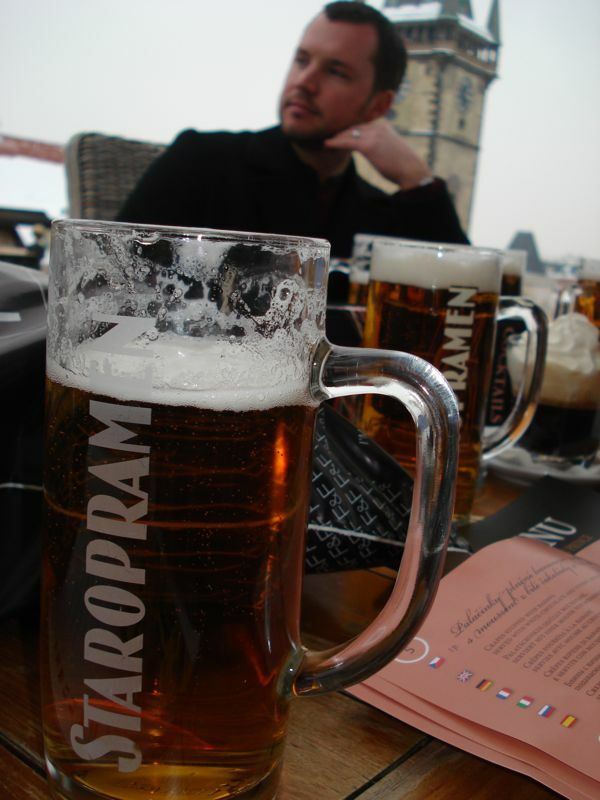 Quite a lovely respite, and not to be missed (Source: www.Prague.cz). Nick and mine's stomachs added to the din by growling their own announcement that we were well past lunch time. Since Nick and I were waiting to meet up with Jenny, Joe, Amber, and Kristal, we wanted to victualize in close proximity to the clock. A quick assessment of the surrounding restaurants with outdoor dining rooms gave me the indication that these were mostly tourist traps. Not wanting to repeat our ghastly dining experience from the night before, we were determined more than ever to discover something slightly out of the limelight of the square and thronging crowds. Strolling slightly east in the square, we happened upon the Hotel U Prince, which modestly displayed a chalkboard menu out front, mentioning it had a rooftop Terrace Restaurant. Warily, Nick and I stepped inside the grand facade into a dimly lit lobby that blessedly seemed to be free of the crowds and boasted medieval stylings. Navigating our path to the rooftop proved to be a daunting task, but eventually we were successful. Once inside the lobby, we proceeded to the back of the building and took the glass elevator on the right, past the stairs heading downward. We rode to the highest floor and then exited, taking the door on the left into an outdoor courtyard. We then proceeded up the staircase and inside another door. We found this to be the bar and restroom area, but to reach the restaurant, we had to turn right and exit outside through yet another door, mount another staircase, and alas arrive at the summit. There were several levels of seating areas boasting different views, all of which take your breath away. And yes, the restaurant is OUTSIDE, and yes, it was still snowing heavily. 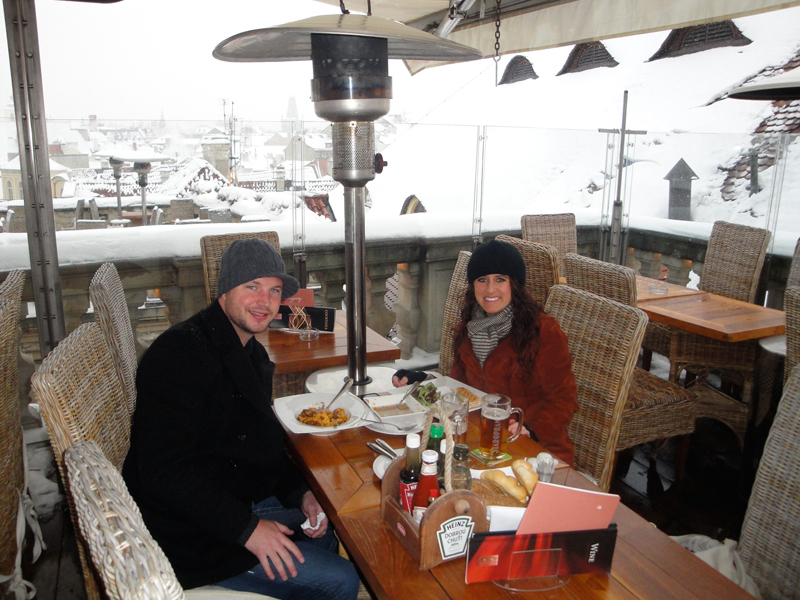 The snow proved to be no problem, as the waiter guided us to a covered area featuring large outdoor gas heaters. 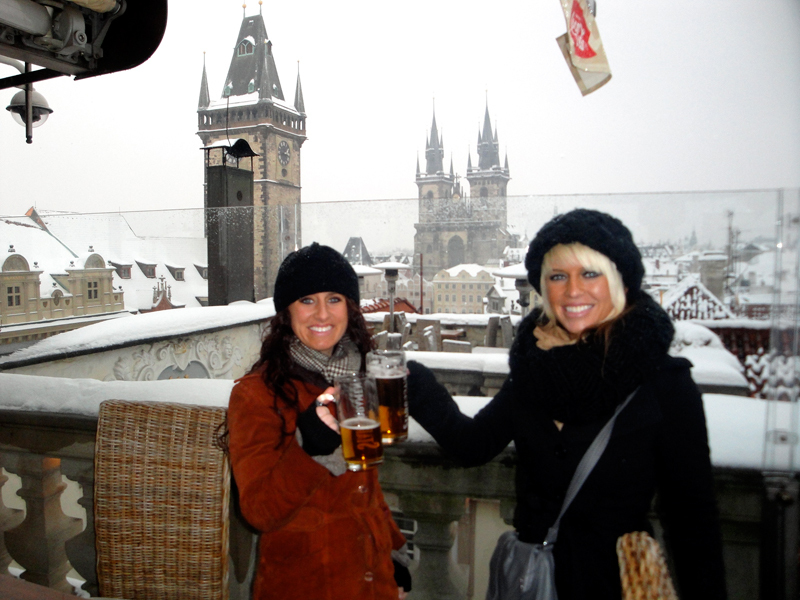 Nick and I reveled in the fact that we were seated at a table with a superb vantage point of the astronomical clock AND Prague castle, not to mention every single gorgeous spire in Prague. Our waiter was incredibly courteous and helpful, and he presented their substantial menu to us for our review. Page after page revealed delicious dishes ranging from local cuisine to Italian pastas, all with multiple language translations and some photos, which admittedly proved to be not only convenient for a non-Czech speaking visitor, but also tempted my appetite further. Nick and I decided to share several items, including the Chicken Soup with Home-Made Noodles and Vegetables for 79 Kč, Panini with Prague Ham, Cheese and Rucola Served with a Small Salad for 129 Kč, and a bowl of the Home-made Pappardelle in Bolognese Sauce for 159 Kč, complete with large steins of Staropramen, a tasty Czech beer. I half-expected the fare to be flavorless, given that the restaurant could sustain steady business with its desirable views alone, but I was mistaken. The soup was hearty and delicious, the pasta cooked 'al dente' and complemented well by the bolognese, and the ham and cheese sandwich was so tasty that I devoured every bite. And we couldn't resist ordering another round of Staropramens to wash it all down. At this point, I received a text message from Jenny alerting me that she, Joe, Amber, and Kristal had just arrived in the square. I replied to her, telling her to look up high and to her left. 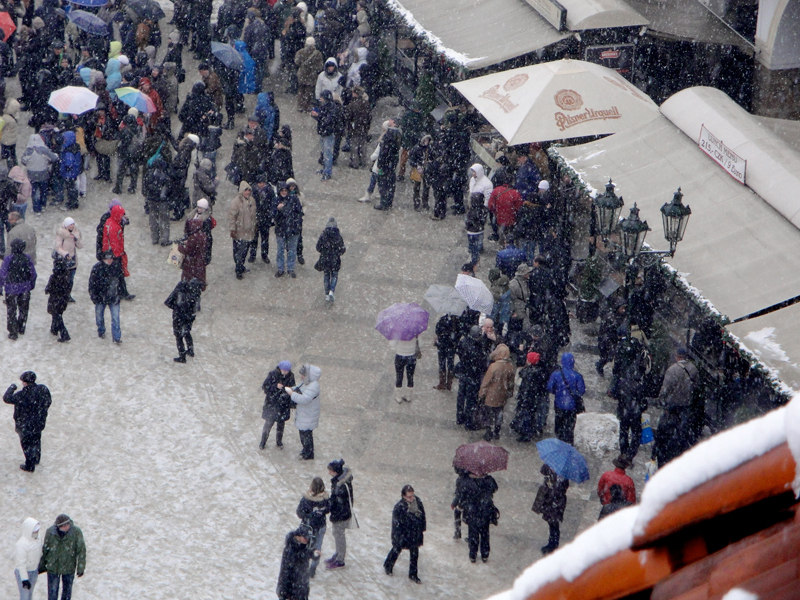 Like a silly schoolchild, I ran to the wall of the restaurant and began waving wildly at them from the snowy rooftop, as I could visually locate their polka-dot and purple umbrellas quite easily. They saw me and echoed my enthusiasm with waves of their own. Jenny texted me and asked how I happened to climb upon a roof? I busted out laughing as from their point of view, they couldn't see a restaurant or wall, and I appeared to be suicidally perched on a random rooftop. To their relief, I explained where I was, and they joined us on the rooftop. They were equally impressed with the incomparable views and the appetizing food (the only item ordered that didn't live up to the standards was the Home-made Ravioli filled with Mushrooms and Ricotta Cheese served in White Wine Sauce). 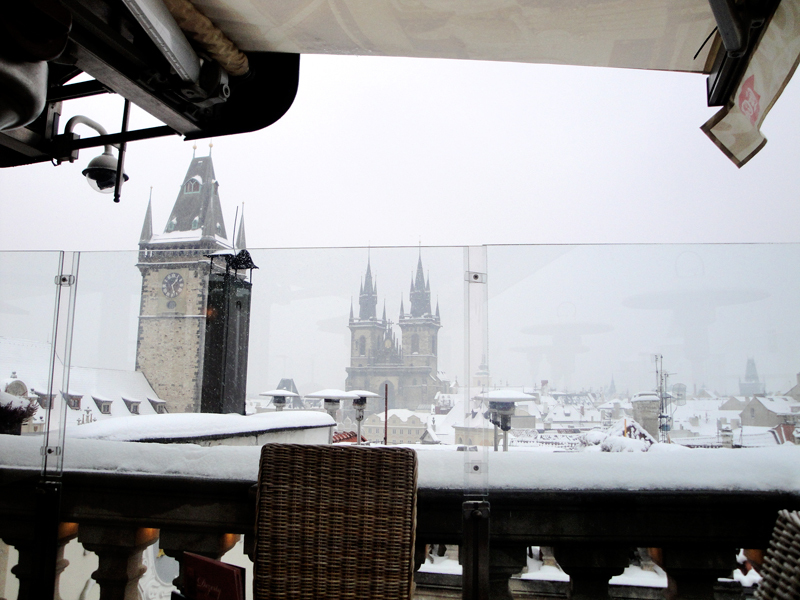 Our experience was so satisfying, that we returned the next evening for a late afternoon meal, enjoying the chimes of the clock and romantic views of Prague castle. Unremembered by me at the time, our good friend Megan had apparently recommended this place to me as she had encountered it over a year ago on a summer holiday to Prague. She was quite delighted that we found it for ourselves and also gave it a glowing review. The Hotel U Prince should not be overlooked by any discerning traveler to Prague, as it masters the art of combining competitive prices, gorgeous surroundings, relative privacy and solitude, excellent service, and varied yet tempting cuisine, all tucked in a lofty paradise, high above the crowds below. Restaurant Cover Charge: Remember that, like all restaurants in Prague, the restaurant at the Hotel U Prince charges a per person table setting fee, which covers your bread, silverware, and condiments. Getting Up There: Once inside the lobby for Hotel U Prince, proceed to the back of the building and take the glass elevator on the right, past the stairs heading downward. Go to the highest floor and exit. Take the door on the left into an outdoor courtyard and proceed up the staircase and inside another door. To find the restaurant, turn right and exit outside through yet another door, and mount another staircase. Viewed 12348 times so far.